The snowcapped La Sal mountains appeared on the hazy horizon as we drove east on Interstate 70. I felt a surge of longing and excitement. That first sight of the mountains meant that Moab was close, and that soon I’d escape the real world and lose myself in the enchanted high-desert tablelands and alpine mountains of that strange, beautiful place. We exited the freeway, and turned southbound on Utah Highway 191. Hoodoo rocks, battleship mesas, and boxed canyons filled the foreground. And in the background, where they always seem to be, were the La Sal. Details emerged–avalanche paths still rumpled with snow. Bare boned aspen trees struggling to leaf out for the coming summer, craggy hillsides, deep juniper forests, and evergreen trees straight as soldiers. The dichotomy of desert and mountain. Sandstone and Aspen. Snow and rock. Fire and ice. We passed by campgrounds brimming with RVs, and a museum with giant metal dinosaurs set in the sage. The line to see Arches National Park was bumper-to-bumper from gate to highway–a 60 minute wait. 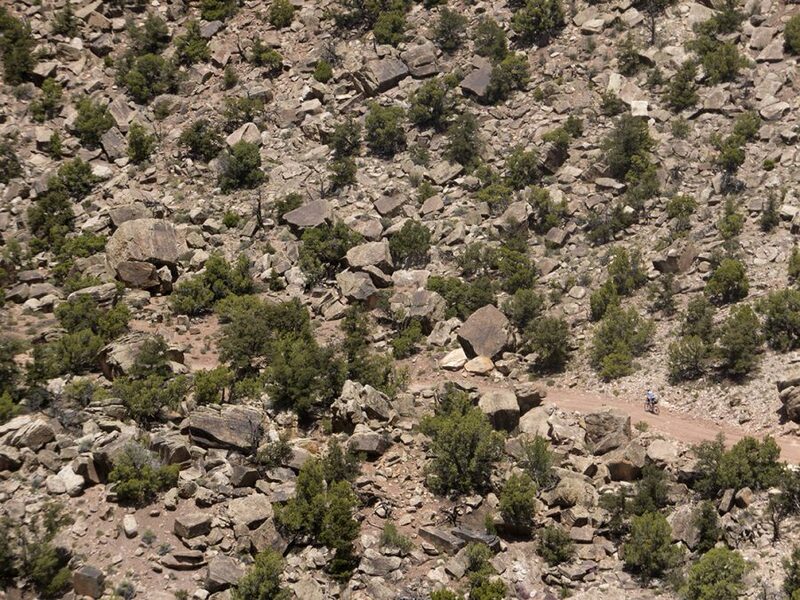 Moab itself buzzed with holiday traffic. Parking lots were full. Gas stations were crowded. NO VACANCY signs were lit. Late spring in Moab. We braved the noise and people just long enough to abandon the truck, saddle up, and pedal away. The sun dropped wearily behind the distant Maze and White Rim, painting the looming La Sal in honey-thick light. By now, we were pedaling upward into the mountains. Our headlights bobbed excitedly in the twilight. Campfires glowed nearby, lighting the smiling faces of vacationers who looked on with curiosity as we rode further up the road and into the darkness. After a few hours we started looking for a place to sleep. But the campgrounds were full. And anyway, we’d left them all behind. So we did what any self-respecting bikepacker does–we found a flat place among the junipers, and went to sleep. Moab wasn’t always so busy. Nor is it always so busy now. It’s peak tourist season. And that means motor vehicles. Vans with hippies. Vans with families. Campers, Jeeps, Suburbans pulling trailers loaded with motorcycles. Most of the people will stay within 10 miles of town. A few might go out and see Grandview Point. Maybe a few others will venture to Potash or Bartlett Wash. But the majority will stay close to the highway, and just a stone’s throw from the glowing comfort of City Market and Wendy’s. Some won’t leave town at all. A soft room, and an afternoon walk down Main Street are good enough. And I suppose that’s alright. I didn’t come to Moab for the t-shirt shops or the dinosaurs. I’m here to see the place where mountains and desert collide, to feel the sun on my skin, and to remember how small and insignificant I am. 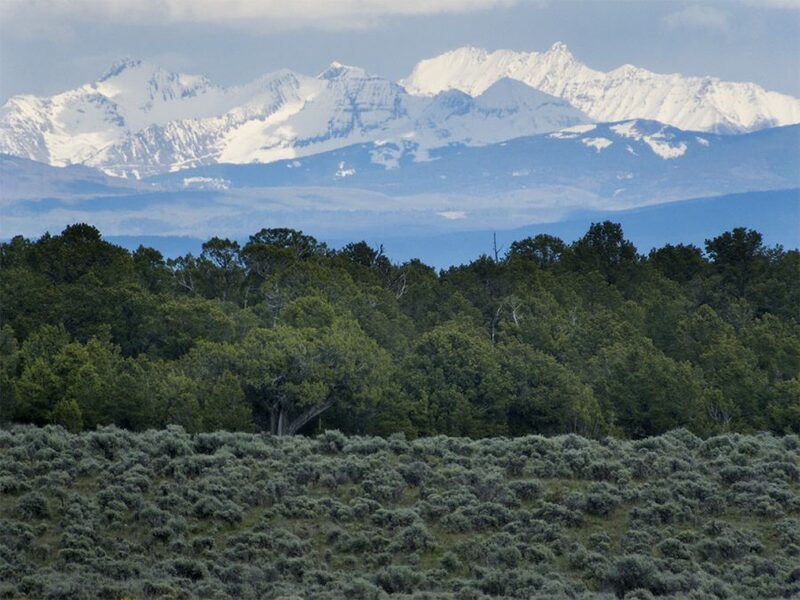 The plateau country of Utah and Colorado is complicated, messy, and enormous. It’s a place that is deadly, deceiving, and dreadful. But it’s also a place of peace and quiet solitude. But that solitude won’t be found downtown. A faint glimmer of dawn encroached on the dark of night. I shivered in my bag and pulled my quilt over my head. It was no use. The chilled morning air cut through my down layers. Frost caked the top of my bivy. I reluctantly crawled out of the tube, teeth chattering uncontrollably. For a moment I stood shivering, ignoring the cold, and watched the morning’s light bounce off the red rocks of Arches and the snowy peaks of the far away Henry mountains. Our road ahead led upward, and soon enough the cold of dawn would be displaced with the heat of a thumping heart and churning legs. But until then, wearing all the clothing I had would have to do. 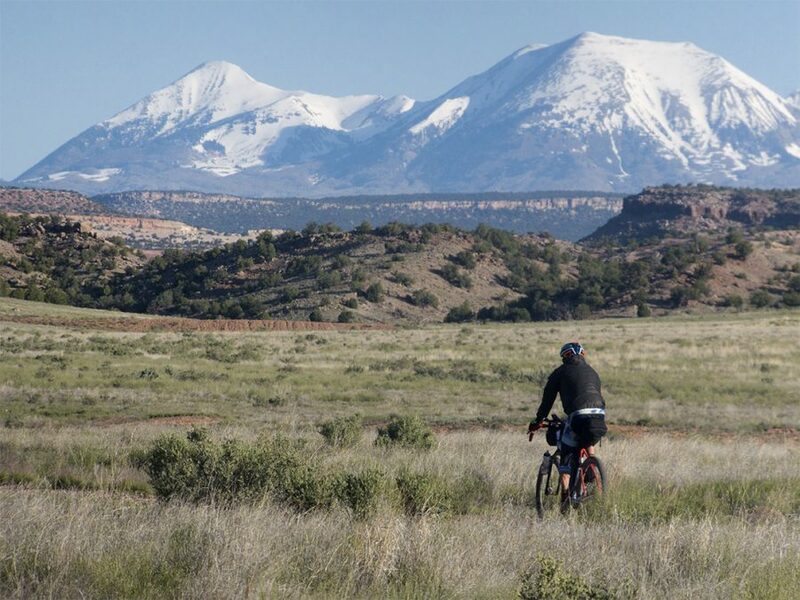 We packed our sleeping bags, ate a modest breakfast–coffee cakes and beef jerky–and with the rising of the sun, continued our climb into the forests of the La Sal. The well-traveled dirt road became a rock-laden doubletrack. It followed the steep grade of the hill. We were riding the La Sal Loop connector segment of Kokopelli’s Trail. Climbing high into the mountains, only to soon lose nearly all the elevation we had gained in a 2500 foot plunge into Castle Valley. And beyond that? Another climb back into the mountains. As I contemplated our elevational plight, an F150 bumped down the road ahead, it’s bed full of cougar hounds who barked at me as if I were a treed lion. “Quiet you!” the driver hollered back at the dogs. By mid-morning we’d regained our lost altitude and were spinning along the backroads through the northeast slopes of the mountains. Sporadic clouds moved in groups overhead, occasionally spitting rain on us as we rode. The creeks and rivers were full. The meadows, green. A small herd of elk raised their noses at me in wary curiosity. The air was cold and clean. A light breeze brushed the treetops. The tablelands and tawny rock mesas unfolded below the mountains in layered perpetuity. 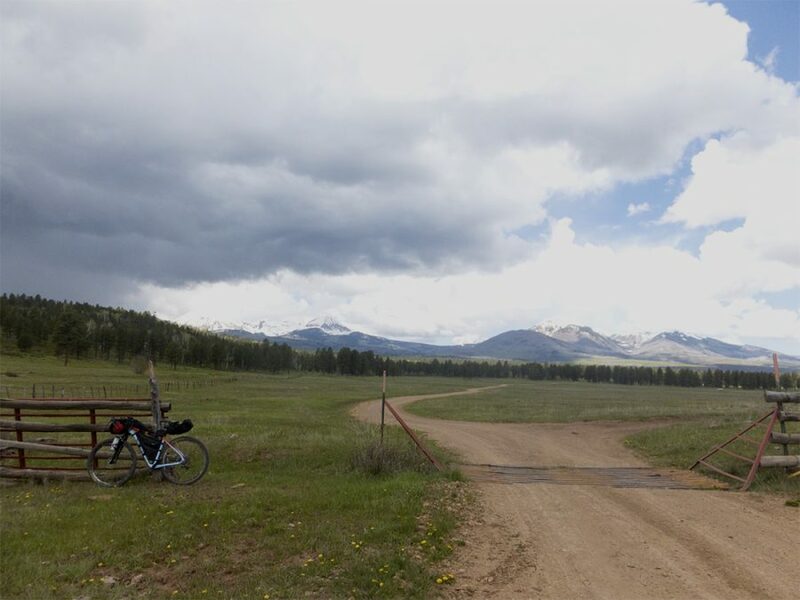 We’d left Kokopelli’s Trail, and were now pedaling the Paradox Trail through lodgepole pine and aspen forests. 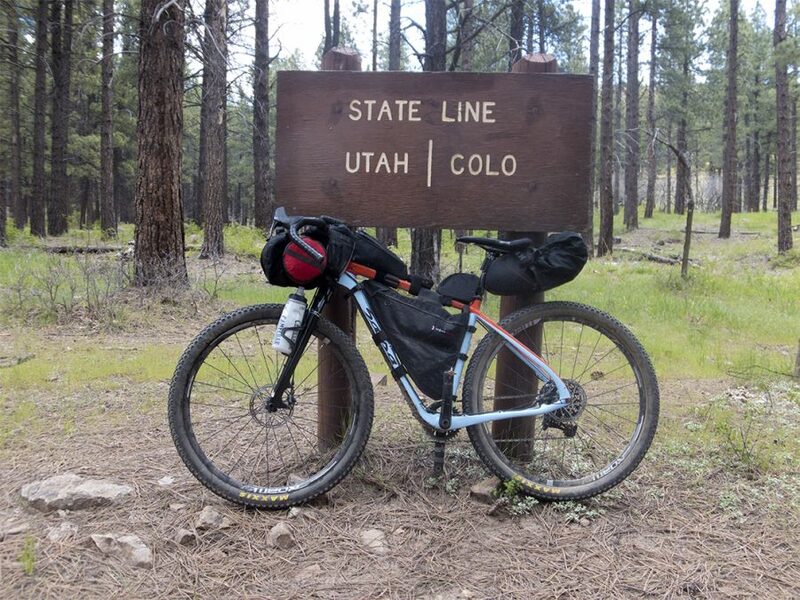 We were following the ghosted tire tracks of bikepacking pioneers who, years ago, had created, and then completed, the Grand Loop–to this day one of the most difficult and unknown of bikepakcing routes. 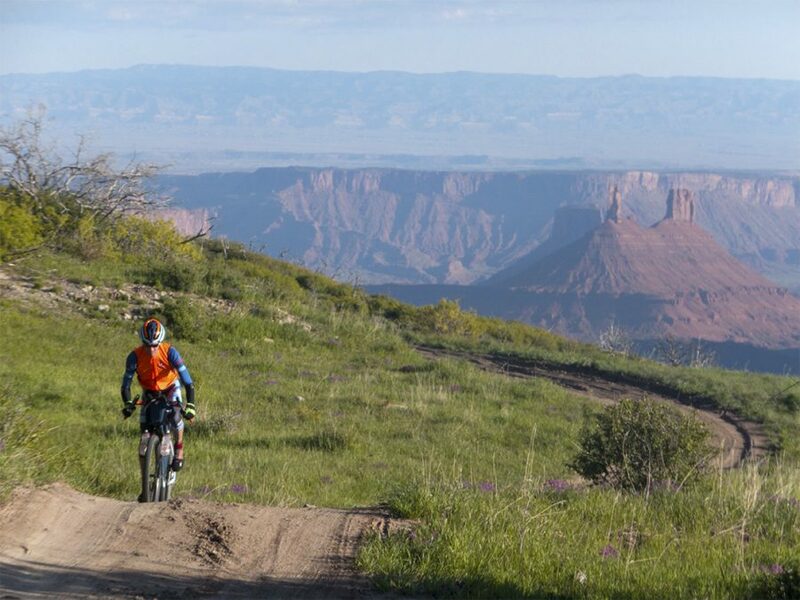 Mike Curiak, Dave Harris, Scott Morris, Jefe Branham, and others, connected the Kokopelli, Paradox, and Tabegauche trails into a 360 mile circle of remote Colorado Plateau wilderness. Our route was less ambitious, but still remote, empty, and rugged. Bikepacking has a way of making people feel small. Or, perhaps it’s not the bikepacking, but the earth itself. Riding loops on a bicycle through folded, crumpled landscapes is slow. Even on smooth dirt roads forward progress comes with a price. But this is a good thing. Too much of our daily lives are spent bypassing terrestrial difficulties, sitting at comfortable desks, sleep-walking through a haze of security and instant gratification. But bikepacking changes all of that. Bikepacking helps a person appreciate the simple things–smooth trail, tailwinds, shade, and a general store with generous hours. Bikepacking takes people far from the tourist traps, paywalls, and bumper-to-bumper queues, to places at the edges of the map. Places that the tourists miss and that the guidebooks ignore. It’s these places that make the tiresome pedaling and the hike-a-biking, and the long hours in the saddle worth all the trouble. Watching the sun set from a high-desert plateau with the Abajo mountains to the south, the La Sal to the north, and the San Juan in the east is an exclusive right. Soon we did know. 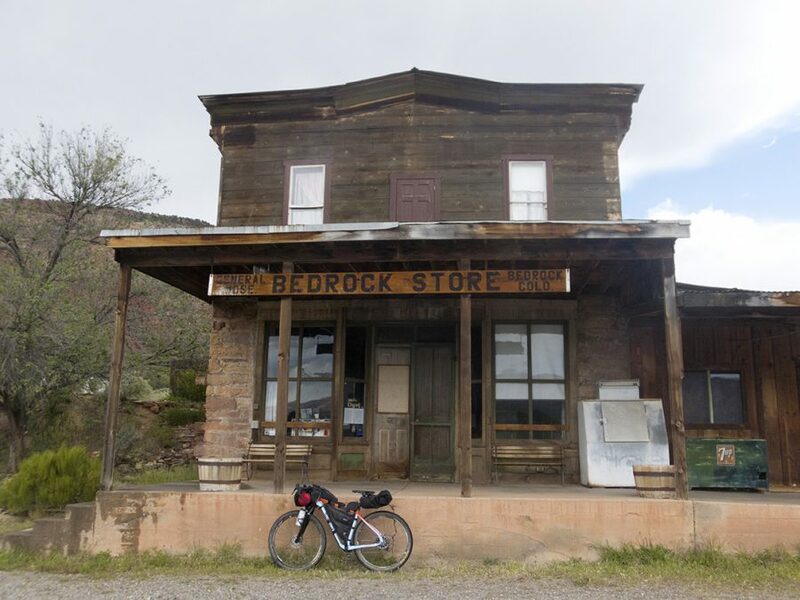 The famous Bedrock General Store was closed. Just as it has been for more than 5 years. We stopped anyway. I wanted to nap on the porch. Ty wanted to ride. I ate some candy, took a picture. Naturita was 21 paved miles away. 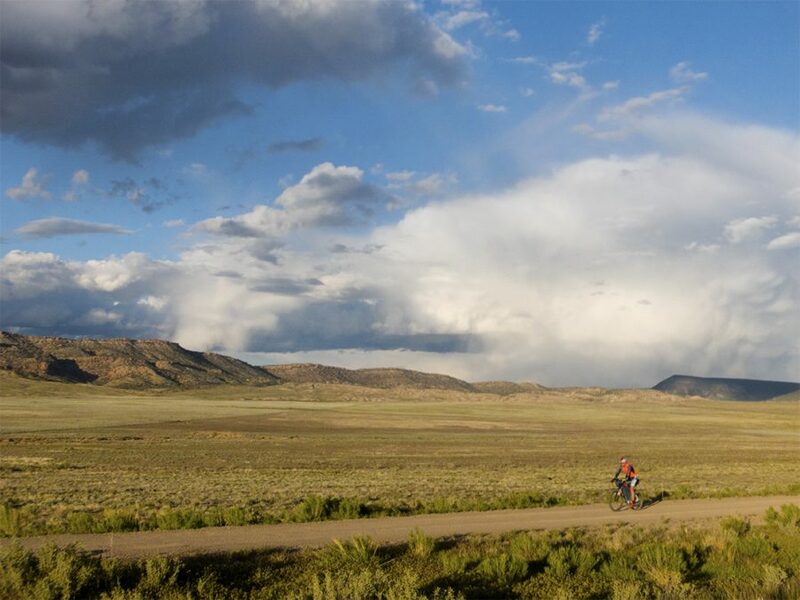 We rode through the Paradox Valley, across the Delores River, and over the rolling sage plains until at long last, we arrived in town for burgers and resupply. The long slog along the pavement had soured my mood. But the chocolate malt and a Blondie’s Special helped change that. The friendly man at the gas station did as well. It wasn’t long before the highway and the town were far behind us, and more gravel, more slickrock, and another golden sunset was just ahead. I spend most of my days sitting in a chair behind a wheel or in front of a screen. I drive up and down the same crowded stretch of freeway, and past the annual (and seemingly eternal) rows of orange barrels, to an office where I sit at a desk doing the same thing. Every day. Day in. Day out. If I look too closely, it’s easy to be agitated. But generally, it’s not a bad life. I have a stable job that funds my adventures. A wonderful family. Great riding buddies. And nothing to complain about. But sometimes I do look too closely, and when I’m done being agitated, I’m resolved to get away for a time so that I might remember what it means to live with simple goals and simple needs. After a long climb up a big hill, and passing through vast ranchland and a place called Beard’s Corner, it was time again to start looking for a place to sleep. The sun sunk into the west as we rolled easily through the Big Gypsym Valley. The road was smooth. The grade, negative. Our moods, high. Just after sunset we crossed the Delores once again, and made camp at the primitive boat launch. Fat, dark clouds threatened us with rain, but none fell. We dozed under the spinning Big Dipper as another day passed–one more of countless billions–in this land of bedrock and paradox. Midday heat beat down on my shoulders. It felt good. But I was craving something cold and frosty. The outpost of La Sal, Utah was 2 miles away. Would the store be open? Only one way to find out. We rode past aging farmhouses, barns, and horses, until we arrived “downtown” – home to a small post office and a general store. The store was open. And air conditioned. Inside, behind glass were cold drinks and ice cream. Ty and I sat at the lone table guzzling, scarfing, and devouring. Travelers came and went. Families, solo motor bikers, folks on ATVs. We were just 30 miles from Moab, and it wasn’t even noon. After ducking in and out of the grottoes and box canyons of the La Sal foothill country, Moab was once again visible in the valley below. When we arrived back in town, the crowds had thickened. The traffic too. The sidewalks were crowded with tourists. Milt’s dive-in had a 60 minute wait. We loaded the bikes into the truck, made one last stop for cold, sugary things, and pointed the wheels northward, homeward. The slow, labored nature of the trip dissipated. It all felt sudden now, as memories do. The snow-capped La Sal mountains disappeared into the hazy horizon as we drove west on Interstate 70. Great post, man. Reading it from my desk here at work made me realize how much I can’t wait to ride tomorrow. 35.92 days til Crusher!